Skull patterns, sometimes to be found in the shape of stick-men and hearts. I mean, what else is there to do with millions of bones, right? It’s Paris: there’s tourists everywhere, and there’s queues everywhere. So, naturally, we had to stand in line to get down into the Catacombs. In fact, it was so busy that I even managed to pop over to the pharmacy across the street in that time to grab some cough syrup (not that type of cough syrup…I actually had a bad cough). However, despite the throngs of people, I was surprised that I still managed to have several stretches of walkway all to myself, often for minutes at a time. I guess that’s testament to the expanse of this underground cemetery. All those who were involved in digging this: I do not envy you. What you need to know is that actually only a small portion of this underground network is open to the public. Most areas are closed off and difficult to access, though of course that doesn’t stop everyone. People have been known to sneak down and hold full-on raves and parties; “cataphiles” host secret tours and investigations; and various societies organise art exhibitions and concerts. However, the most intricate discovery to-date surely has to be the secret cinema that was found by the police in 2004: completely equipped with giant screen and projection equipment, audience seats carved into the rock, plus a fully-stocked bar and restaurant. The people behind this set-up were never found (I would have loved to talk to them, I’m sure they had some great stories to tell!). 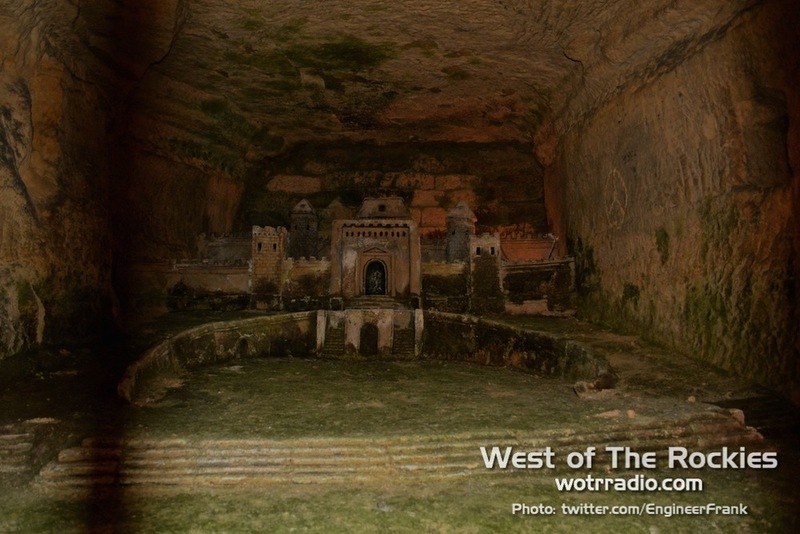 The Paris Catacombs opened in the late 1700s, and started growing into a popular tourist attraction in the 1800s. Of course, there’s always been debate about whether such a place should even be open to the public – quite naturally, a lot of people find it distasteful to turn people’s bodily remains into a tourist attraction for entertainment purposes; the church has kicked up a fuss in the past on the grounds that the bones are sacred, which is also understandable. Nevertheless, one cannot deny that the Catacombs are an extraordinary feat of art and engineering. 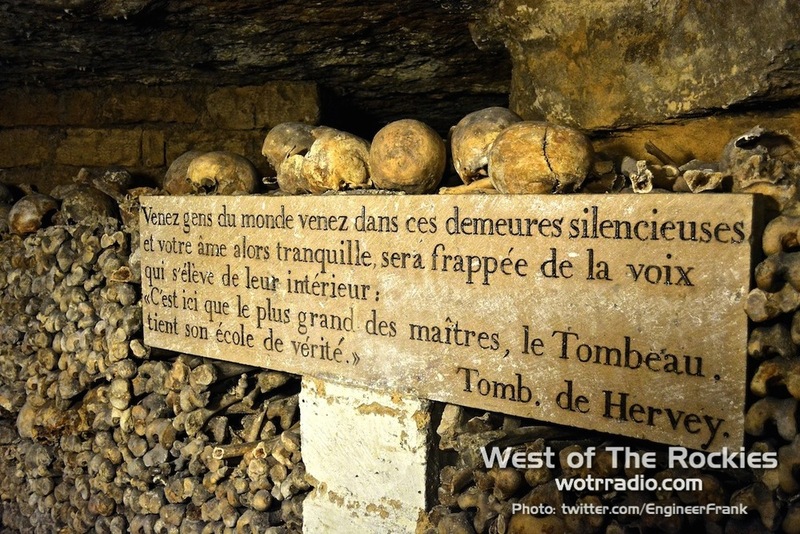 Six million people’s bones, 200 miles of tunnels and caverns, and hundreds of dark and poetic quotes – the Paris Catacombs really are something else. "Warning: The ossuary tour could make a strong impression on children and people of a nervous disposition." While the imagery is undeniably dark and spooky, it’s strange to think that humans should be afraid of other human remains. I mean, we all have bones in our bodies, right? That should surely make us less afraid. On the other hand, I guess for a lot of visitors that “strong impression” is less one of fear, and more a realisation that life is extremely fragile, that all these bones were people with families and friends at one point…there’s definitely a strong chance of existential anxiety when down there amongst all those skeletal remains. "Stop! Here lies the empire of death." Why were the Catacombs built in the first place though? To summarise, Paris cemeteries were quite simply becoming overcrowded and ridiculously unhygienic, to the extent that they posed serious health hazards to the people living in the adjacent areas. Les Innocents, which can be found in the Les Halles neighbourhood of Paris, was the city’s first Christian cemetery, and would also become Paris’ most well-known. The bodies piled up over the centuries, with war and disease being the biggest contribution: in fact, the plague of 1418 saw 50,000 bodies added to Les Innocents within a mere five-week period. The hundred-years war brought many more. It was said that the area smelled so bad, that even perfume shops started going out of business. Just imagine that – a stench so awful that even perfume is overpowered. However, the final straw came in 1780, when a particularly rainy Spring season caused a cellar wall around Les Inncocents to collapse, resulting in a mass of decomposing corpses and diseased mud being spilled into a neighbouring property. Something needed to be done, and it needed to be done fast. 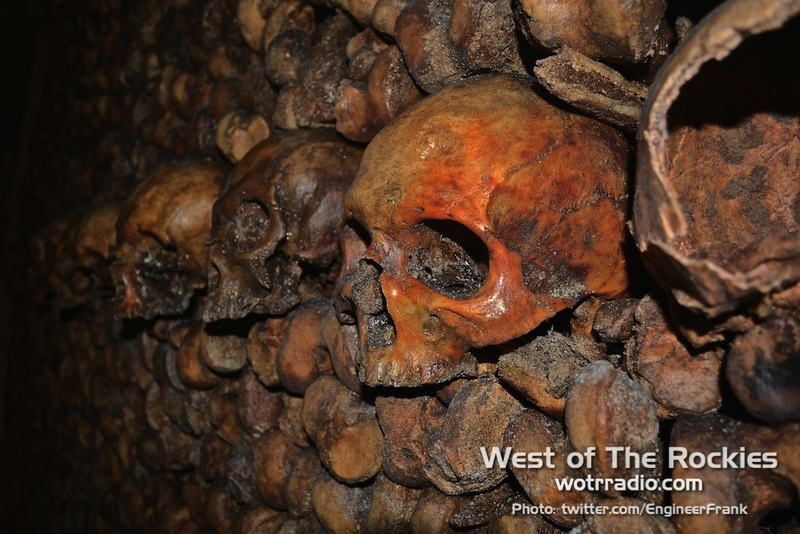 Thus began a 12-year-long process of moving the city’s bones below ground, into Paris’ abandoned stone quarries. Not only were there millions of people’s bones, but they also dated back hundreds of years; some going as far back as 1,200 years, from an era known as the Merovingian period. Yes, it was a very big task. Enough of the gruesome facts for now though, let us move on to my favourite part: the poetry. Various literary and Biblical quotes are dotted around the entire network at regular intervals – there’s something about them that completely transforms the experience…it’s as if there’s a narrator guiding you through the tunnels, giving you nuggets of wisdom and thought-provoking ideas to ponder as you amble through the catacombs. It’s truly great. That’s blown away by the slightest breeze. presente, que deja elle n’est plus. This one. This one I especially like. Throughout this article, I’ve made sure to keep the translations in the best physical order possible, because I’ve seen a lot of translations that shuffle up the positioning of the words. That is, if a line ends with “toujours,” I’ll try my best to ensure that “always/eternal” is also at the end of the line. It’s important, honestly! Take the above quote. It begins with a question, “Where is death?” The word that immediately follows it is eternal (or “eternally,” “always,” “forever”…I wasn’t quite sure what to settle on). Giving “toujours” some space to itself really draws our attention to it; even though it is part of a sentence, it could be a sentence in itself – in a way, it answers the question, “Where is death?” quite well. Because death is indeed always there, it’s an eternal fact of life. However, then the stanza moves on to the next line, and the sentence concludes with, “in future or past,” giving us an alternate answer to the question. This time we are being told that death is fleeting, difficult to catch; somehow always in the past or future, but never quite in the present. OK, enough of the English session – I just wanted to emphasise the depth of some of these poems and the importance of accurate translations. Now back to skulls and stuff. Whichever way you turn, death’ll be waiting for you. Croyez que chaque jour est pour vous le dernier. Think that every day will be your last. (5) Those graffiti etchings? Absolutely blasphemous. Occupe entre ces murs la poussière des races! Que de morts entassés et presses sous la terre! Le nombre ici n’est rien la foule est solitaire. Occupied between these walls, the dust of the races! That the dead, piled high and pressed ’neath the earth! The number here is nothing, the crowd is solitary. la mort est un gain. For me…to die is a gain. Melius est mihi mori quam vivere. It is sometimes better to die than to live. It would bring forth much fruit. et quæasivi eum et non inventus est locus eius. J’ai vu l’impie adoré sur la terre. His towering and presumptuous Head. Passing I turn’d, I lookt, and he was vanisht quite. On this sea where all disappears. est entrée dans la monde. death came into the world. Commence, paroît et n’est plus. Begins, appears and is no longer. font murs et les autres verts. that build walls and make others envious. of death, ‘tis a sin. In certa sed mortis dies. Man escapes the last light. Alas, that’s all for now. 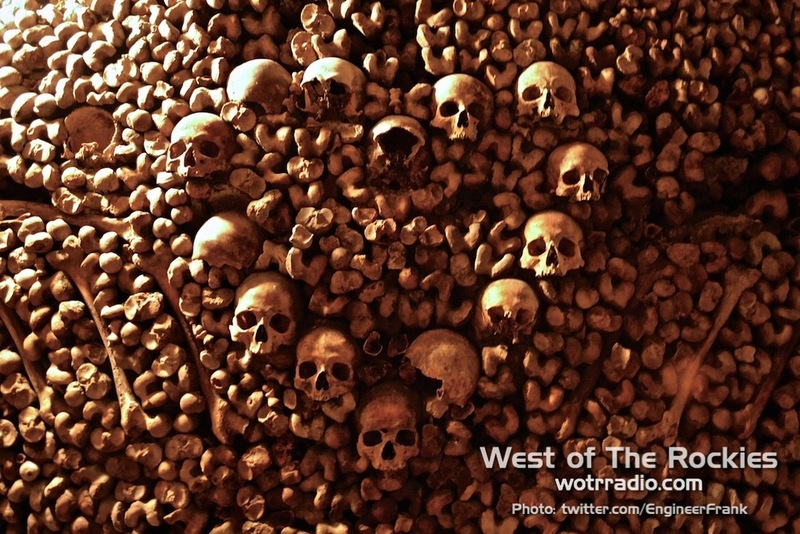 Want a little more of the Paris Catacombs? Maybe start by checking out the apparent mystery camera that was discovered in the depth of the catacombs. As the urban legend goes, an abandoned camera was found in the catacombs and, upon watching it, it appears that the cameraman became frightened for some reason and dropped the camera, with his footsteps being heard running off into the distance. It’s a modern mystery – though it does undeniably reek of a fake, it’s still fun to ponder.